Looking for a job in Bulloch County Georgia? 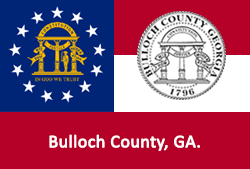 Bulloch County has a robust economy and is a regional trade hub for commerce, education, and health care. Bulloch County's primary city for this review is Statesboro. Only cities that have job listing pages or verified contact listings are provided below. Bulloch County maintains a job board with fresh listings. A survey of open positions found had included Bulloch County Correctional jobs, Aquatics Manager, Chief Counselor, Correctional Officer, Maintenance Worker, Sheriff's Office Jobs, Jail Deputy, and more. Their site also provides an index of area employers. The City of Statesboro is a good resource for monitor for a variety of ongoing job opportunities. Here positions were found during this review such as Training Captain, Firefighter (Full-time), Collection Equipment Operator, Senior Equipment Operator, Refuse Collector, Groundskeeper, Natural Gas Service Technician, Firefighter (Part-time), Certified Police Officer, and Non-Certified Police Officer with info regarding New Certified Officer Hiring Bonus Program. When open positions are available through the Careers page, click the link and apply for the job opening. The Statesboro-Bulloch Chamber of Commerce is a resource for finding local business contact information and also provides a small job board. Viracon is a leading single-source architectural glass fabricator with a location in Statesboro. Some jobs found had included Process Engineer, Maintenance Mechanic Nights, and Engineer Intern. Briggs & Stratton operates a manufacturing facility in Statesboro. During review there were open positions posted. Walmart offers careers in retail, grocery, pharmacy, optometry, stocking, and in various specialty roles. Statesboro Mall has over 30 active businesses. You can use their directory for individual retailer contact information to inquire about job opportunities. Lowe's is committed to a workplace culture that leverages diverse talent to create innovative solutions. Employees thrive in an environment where everyone can reach their full potential and provide customers with a great shopping experience. East Georgia Regional Medical Center provides a high medical standard of care. East Georgia Regional Medical Center frequently has a high volume of open positions available. A sample of careers available included Admissions Supervisor, Assistant ER Director RN, Cardiovascular Invasive Technologist, Case Manager RN PRN, Certified Surgical Technician, PRN Nursing Jobs, Telemetry Nursing, Chief Financial Officer (CFO), Clinical Coordinator ER, Licensed Practical Nurse LPN ER, Pediatric Nurse Med Surg, Medical Lab Technologist, LPN Telemetry PRN, Maintenance Engineer, Med Lab Tech, Medical Technologist, Nursing Assistant, ICU Nurse Assistant, Nursing Assistant Telemetry, Pediatric Nursing Jobs, PRN Physical Therapist, Respiratory Theraphy RRT PRN, Registered Nurse RN CCU, Registered Nurse RN ER PRN, Registered Nurse RN Med Surg, RN Nursery PRN, Speech Therapist PRN, and Ultrasonographer PRN. Pineland BHDD provides services to minimize the impact of mental illness, developmental disabilities and addictive diseases. A survey of open positions found had included Houseparent (CNA preferred), Social Service Tech [SST] (Bachelor's Degree in a Behavioral Health field), Instructor (Bachelor's Degree preferred), Instructional Aide, Health Service Tech, Health Care Workers, Substance Abuse Counselor (Master's Degree in a Behavioral Health field), Registered Nurse [RN], LPN, Licensed Social Service Provider, Vehicle Operator, Peer Specialist, Job Coach, CSI Worker, Food Service Workers, Custodian, Clerk, and Secretary. Altrus provides a comprehensive group of residential services to individuals in the community. Open positions included Residential Care Aide Med Tech. Heritage Inn Health and Rehabilitation was hiring for the position of Certified Nursing Assistant (CNA) on this review date. Check for new listings. is always seeking great team members who will help older adults live better. Positions range from caregivers and culinary staff to in-home care companions and managerial staff. Bethany Home provides the highest quality of healthcare available for the aged and infirmed. On this review date there was an open position for a Certified Nursing Assistant (CNA) or Certified Medication Assistant (CMA). Optim Healthcare was hiring for the positions of Nurse Practitioner, Front Desk Supervisor, and Physical Therapy Aide (PRN). Bulloch County Schools is a public, pre-kindergarten through twelfth-grade school system. The Bulloch County Board of Education is Bulloch County's second-largest employer. Employment listings include Intermediate Teacher, High School Teacher, English Teacher, Social Studies Teacher, Head Custodian, English Language Arts Teacher, Language Arts Teacher, and a variety of substitute positions and school bus driver jobs. Statesboro STEAM Academy is dedicated to providing a high quality, outside of the box, STEAM-based blended learning educational program for all of its students. You can apply for employment for Substitute Teachers, Tutors, Middle School Teachers, Math Teachers, Science Teachers, English Language Arts, Social Studies, High School Teachers, Specialty Teachers, Administrative Staff, and Custodial Jobs. Bulloch Academy's carefully planned curriculum engages students and their teachers in an intellectual exploration that makes school exciting and creates a warm and welcoming environment for students who love to learn. If you are a qualified teacher dedicated to providing a solid Christian education to your students, and have a strong commitment to Jesus Christ as your personal savior, you are encouraged to send your resume. Georgia Southern University is the state's largest and most comprehensive center of higher education south of Atlanta. Georgia Southern University has ongoing job openings for Faculty, Support Staff, Students, and Temporary Openings Positions. Some positions found had included Accounting Information Analyst, Plumber, Accountant, Food Service Jobs, Administrative Specialist, Admin Assistant, Quality Engineer, IT Jobs, HVAC Tech, and more. East Georgia State College is a part of the University System of Georgia. Openings found had included Accounting Technician, Part Time ACE Tutor, Full-Time Police Officer, Clerk, Food Service Worker I, Housing Safety Assistant, Receptionist, Resident Assistant, and more. Ogeechee Technical College provides the highest standards of education allowing greater opportunities for students. The college boasts hands-on instruction, small class sizes, one-on-one instruction, and state-of-the-art equipment. During review there were open positions for faculty and support staff. The Bulloch County Sheriff's Office periodically hires law enforcement officers and civilian support staff to provide law enforcement, safety, and security for the community. The Statesboro Police Department's Recruiting page provides information about Police Officer hiring requirements, disqualifiers, hiring process, benefits, and more. Certified Police Officer starting salary is over $32,000 annually. The City of Statesboro Fire Department was hiring Part-time Firefighters on this review date. These jobs were found on the main city employment page. Choose "JOBS" from the drop-down manu.